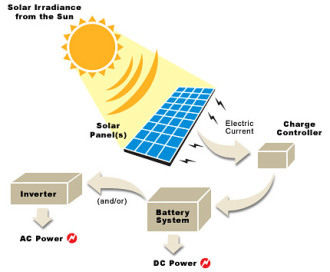 Sun Power: Are You Self-Sustaining? A consistent theme of Chief H. Yuya Assaan-Anu’s this year, has been one of self-sufficiency. He encourages self-reliance in Divination and is adamant about our consulting our Ori before any entity outside of us. Chief’s push for Self-Actualization was even weaved throughout the tips he offered for mental, physical, and spiritual stability at the beginning of this 2014 financial year. So, it was of no surprise to me when he offered us a show giving instructions on how to build a solar-powered generator. This generator is effective for powering a small refrigerator, a laptop, a cell phone, a lamp, or a variety of other allowances in a setting where artificial sunlight is lacking. Although I found the explanations of this generator interesting, if you’re not particularly fond of science, you might just want to trust the list of supplies Chief has given below. However, if you like appreciate the details of how things work, then check out Chief’s show, Sun, Solar Power, and Moving Off the Grid. True-to-form, he offers wisdom on various life topics, as opposed to just the one listed in the title. The goal here is to simply get you out of your comfort zone and quickly into dealing with sun/ solar-powered energy. My suggestion is that if you are not familiar with solar technology and to quickly get you into a self-sustaining mindset, stick with this very basic model at first. Then if you want, you can save for again over the next 6-8 months to get all fancy! Note: Because the Amorphous are cheaper, they’ll give you less of energy output. However, with three decent-sized panels, you can get about 40 Watts of energy (some energy will be lost producing heat), which would charge a Tablet and cell easy, along with other items. Note: Chief suggested the Trojan Brand at Sam’s Club for around $75 each. However, here in Detroit, I could not find any at Sam’s online, but they do have 6V Duracell Golf Cart batteries for $85. (Not a big difference.) I also noticed that the price for the exact same battery varies by state, so either check yours or try Amazon or Google if you want a better deal. An inverter: The electric box with the outlets on it for plugs. Note: Harborfreight.com also has these from $27.99 to $159. Again, Google, Ebay, Amazon are all friends here as well. That’s it! Read the simple instructions in your Solar Kit, Google the instructions, or better yet LISTEN TO THE SHOW! Post your pics below as you get them together. Peace!